I've been reviewing online survey website for almost 2 years now, and I have always stumbled across CashCrate on my searches. Considering its popularity, I couldn’t resist giving my honest opinion on this popular platform. CashCrate is a GPT (get-paid-to) website where you can find a variety of methods to earn money online. The platform is well-known for its high referral payouts and strong reputation. Established in 2006, CashCrate resisted to the test of time with over 2 million members worldwide. Cash payment only via cheque. Paypal is only available for those at the silver level. I am sure you are interested to know if CashCrate stands up for its reputation. So, let’s talk about how everything works and how much money you can expect from each activity. The sign up free and very quick! You just need to provide your email, choose a password and click on the confirmation link in your email. 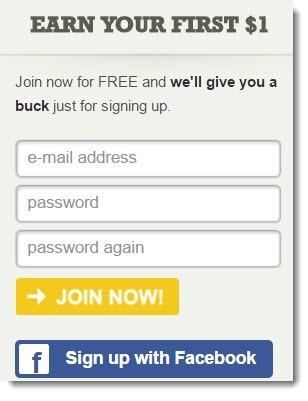 It’s also possible to sign up with one click using your Facebook account. When you are done, you will be credited with your first $1. Complete a brief demographic questionnaire and you will earn more $0.50. CashCrate’s profit relies on businesses that want people to try out their products or join their websites. That’s how they make money and can pay you a small fraction of their revenue. There are many types of trial offers. Just be very careful when choosing offers because some of them are very tricky and you may end up paying for stuff you don’t really want. You should read the terms and conditions from top to bottom, as each offer has its own peculiarities. For that reason, I never accept offers that ask for my credit card. For me, it’s not worth it! How Much Can You Earn For Each Offer? 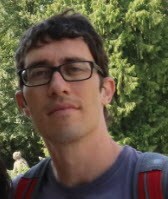 CashCrate will connect you with marketing research companies that want personal information and opinions from a targeted group of people. You will find surveys from Your Surveys, Samplicio, Global Test Market and Speak UP (UK). All of them are trustworthy. There are two problems with online surveys. They pay very little, and you can waste a lot of time with pre-qualifying questions. It’s very common to be rejected and not get paid after answering pre-qualification questions. Most surveys are worth less than $1. When you visit a retailer’s website through CashCrate and purchase a product, CashCrate will earn an affiliate commission. Then, a percentage of that commission is passed on as cashback to you. That’s cool! In fact, there are websites dedicated exclusively to cash back. Top CashBack is a popular example in the UK because they pay back 100% of their commission to the customers. 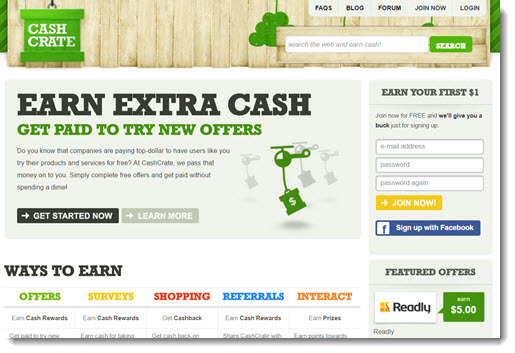 In my opinion, CashCrate offers the best referral program among all the rewards sites I have come across. Upon joining, you will get a unique referral link, which directs people to CashCrate’s signup page. You can send this link to your friends via social media or email. Also, you can place your link on forums, on your own website/blog or wherever you can find viable. The commissions are generous compared to other survey sites! When people join through your referral link, you will earn 20% commission from every dollar this person earns and 10% from what their referral earns (2-tier commissions). Additionally, you will get $3 bonus when your referral earns their first $10. You will reach the Silver status when you reach $500 or refer 50 active members (US only). Besides, it will increase your 1st level commissions to 25% plus you get $1 bonus when your referral completes their first survey or cash offer. Another cool thing is that they will give you the right to have your own blog inside the platform. Then, you can write articles (give your opinions/experiences with CashCrate) and have your affiliate link attached to them. These articles rank on Google and people can find them. When people read your article and join CashCrate from that point, they will become your referral. It can increase your referral numbers even more! There are additional levels as you refer more people. For the list of all levels and advantages, check this page. Similar to Swagbucks, Inbox Pounds/Dollars and Qmee, you can also get paid to search using CashCrate. 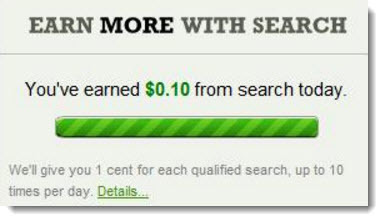 Each qualified search will pay 1 cent, and you can earn up to $0.10/day. The downside is that you need to make at least $1/day with cash offers to unlock the paid search. The 40 members who win the most with surveys and offers on a given month win prizes from $1 to $60. There are many surveys and offer opportunities that earn you points. You can trade in these points for gift cards from a variety of retailers such as Amazon, Starbucks, and Apple. You can also use 5 points to get an entry for prizes in a game called Crates, which prizes ranging from 1 cent to $1000. Your payment will be sent automatically to your address when you reach $20. Unfortunately, Paypal is only available for those at the Silver level. Payments are processed on the 15th of each month for bronze level, and on the 1st for silver level. CashCrate is one of the best platforms to make some easy cash with surveys, offers and simple tasks. There are many ways to make money with CashCrate, but referring people is actually most profitable one. By referring people, you can make FREE money without bothering with surveys and tricky offers. There are many people making good money using this method. So, have you tried CashCrate? What do you think of it? Leave your comments below, and if you need a hand with anything, please don’t hesitate to ask. P.S. 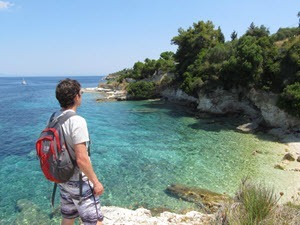 Discover the platform that helped me reach $600/mo from my laptop and pursue a freedom lifestyle! Click here to understand how it works!